A preselector or self-changing gearbox is a type of manual gearbox (US: transmission) used on a variety of vehicles, most commonly in the 1930s. The defining characteristic of a preselector gearbox is that the manual shift lever is used to "pre-select" the next gear to be used, then a separate control (a foot pedal) is used to engage this in one single operation, without needing to work a manual clutch. Most pre-selector transmissions avoid a driver-controlled clutch entirely. Some use one solely for starting off. Preselector gearboxes are not automatic gearboxes, although they may have internal similarities. A fully automatic gearbox is able to select the ratio used; with a preselector gearbox, gear selection remains the driver's decision. There are several radically different mechanical designs of preselector gearbox. The best known is the Wilson design. Some gearboxes, such as the Cotal, shift gears immediately as the control is moved, without requiring the separate pedal action. These are termed 'self-changing' gearboxes, but were considered under the same overall heading. [note 1] In recent years, a similar role is carried out by the increasing number of 'Tiptronic' or 'paddle shift' gearboxes, using manual selection and immediate automated changing. Fast shifting, with only a single operation. This requires less skill to learn than techniques like double declutching and it offers faster shifts when racing. Ability to handle far more engine power, with a lighter mechanism. Their friction components are brakes, rather than clutches. These are simpler to engineer, as the wear components can be arranged to not also be rotating parts. The friction wear components can be mounted on the outside of the mechanism, rather than buried within it. This makes maintenance and regular adjustment easier. They were common on Daimler cars and commercial vehicles, Maybach, Alvis, Talbot-Lago, Lagonda Rapier and Armstrong Siddeley cars as well as on many London buses. 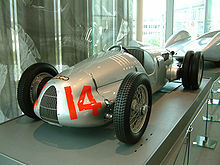 They have also been used in racing cars, such as the 1935 ERA R4D, and hillclimbing cars such as Auto Union "Silver Arrows". Military applications began in 1929 and later included tanks such as the German Tiger I and Tiger II in World War II, through to current tanks such as the Challenger 2. Many pre-selector designs made use of a series of epicyclic gearboxes. The Viratelle epicyclic pre-selector gearbox is the first one known[dubious – discuss] designed and used from 1906, used on Viratelle motorcycles with 3 speeds but also on cyclecars with 3 forward speeds and a reverse gear. The Wilson pre-selector gearbox is the best known design and is the archetype generally meant when the term "pre-selector gearbox" is used without further qualification. Major W. G. Wilson (1874–1957) was rewarded as one of the major co-inventors of the tank after World War I. He had mainly been involved with the development of transmissions for tanks, particularly the problem of their steering gearbox. He had become an advocate for the benefits of the epicyclic gearbox, which allowed large torques to be transmitted whilst still being controllable through a small input force. In 1917, Wilson designed the Mark V tank, which incorporated his epicyclic steering gear. Wilson's major claim for its advantage was that the epicyclic system allowed control through a brake, rather than through a clutch, "a brake can stand more punishment than a clutch and is easier to judge in its application". This was the first of the heavy tanks that could be driven by a single driver, without requiring him to signal orders inside to others working the secondary gear levers. Since 1900, the Lanchester Motor Company had built cars with manually controlled epicyclic gearboxes, first with a cone clutch, then with multi-plate clutches. These formed the ratio-changing gearbox of the transmission. In 1918, an experimental tank "Lanchester Gearbox Machine" or "Experimental Machine K" was tested, fitted with an epicyclic gearbox built by Lanchester. After the War, Wilson had a considerable reputation as an engineer of genius, particularly for gearbox design. In 1928 he patented his design for a novel pre-selective gearbox. Various manufacturers produced preselector transmissions under licence to the Wilson patents. Wilson himself formed a partnership with J. D. Siddeley of the car maker Armstrong Siddeley, first under the name of "Improved Gears Ltd.", then later as "Self-Changing Gears Ltd.". As its name suggests, gear changes were made by selecting a gear ratio in advance of its being needed. The chosen gear was then brought into operation by pressing and releasing the 'gear change pedal', which was normally the left pedal, installed in place of the usual clutch pedal. It is not to be confused with an automatic transmission, in that both the ratio chosen, and the moment for gear changing, are controlled by the driver. The Wilson gearbox was produced with a variety of clutches. The best-known is the fluid flywheel, used for touring cars such as the Daimler and the Armstrong Siddeley. Sports cars used a Newton centrifugal clutch. This was a multiple plate dry clutch, similar to racing manual clutches of the time, but with the pressure plate centrifugally actuated to engage at around 600rpm. Pure racing cars, such as the ERA, avoided a clutch altogether and relied on the progressive engagement of the gearbox's band brake on lowest gear when starting. The Wilson gearbox relied on a number of epicyclic gears, coupled in an ingenious manner that was also Wilson's invention. [note 2] A separate epicyclic was required for each intermediate gear, with a cone clutch for the straight-through top gear and a further epicyclic for reverse. Four gears were provided, at a time when many cars (especially American ones) usually only had a three speed gearbox. This was owing to the sporting, or indeed racing, market for the Wilson gearbox, so that the ratios could be more closely spaced. Although this same arrangement of epicyclics would become the precursor for the post-war automatic transmission, the automatic transmission's use of a torque converter, together with the broad power band and excess power of US V8 engines, meant that wider-spaced, thus fewer, ratios were acceptable. Unlike the "crash" gearboxes of the first half of the 20th century, the gearwheels in a preselector box are permanently in mesh in an epicyclic layout. Changing gear with the Wilson box relied on the control of the brake bands that held each epicyclic's annulus in fixed position. The brake band to be selected was controlled by a rotating cam, moved by the gear shift lever. Only one band was engaged for each gear selection. This small lever could not provide enough power to engage and lock the brake band, thus the need for the pedal[note 3] The actual movement of the brake bands was controlled by the 'toggle' mechanism, a distinctive feature of the Wilson design. When the pedal was pressed and released, a series or 'busbar' of finger-like levers were pressed upwards by a strong coil spring, against a series of light linkages or 'operating struts'. The position of each linkage was controlled by the gear selection camshaft. If the cam (for each gear) held the linkage in place, rather than allowing it to swing out of the way, the busbar finger would then press, via the operating strut, onto the toggles controlling the brake bands themselves. These toggles provided the additional leverage necessary to hold the brake band in place, under the force of the coil spring, until the pedal was next pressed. A further characteristic of the Wilson design was the use of self-adjusting nuts on each band, to compensate for wear. The action of engaging and disengaging each band was sufficient to advance the ratchet nuts and so adjust for wear by taking up any slack. On some cars, starting off from rest involved using the gear change pedal like a clutch. On others, first gear could be selected but while the engine was still idling the car would not move even after the gear change pedal had been pressed and released. When the accelerator was pressed a centrifugal clutch or fluid coupling would engage and the car would begin to move. The Georges Roesch-designed "accelerating gearbox", fitted to some models of British Talbots in the 1930s, would automatically pre-select first gear when reverse was engaged. On engaging second gear, the 'box would then pre-select third, and fourth when third was engaged. It would then cycle between third and fourth until another gear was pre-selected manually. This gearbox used a centrifugal clutch, described by Talbot as the 'Traffic Clutch'. This was a simple device, with two radially swinging shoes, similar to a drum brake. This was invented and developed by Edgar de Normanville and fitted to 1930s Humber Limited cars. It was broadly similar to the Wilson, but used direct hydraulic actuation of the brake bands, under control of a steering column lever, and so avoided the need for a change-gear pedal and the toggle mechanism. Postwar Laycock Engineering in Sheffield built de Normanville's Laycock-de Normanville overdrives for a wide range of British manufacturers. The Cotal self-changing gearbox of the 1930s was a manually controlled epicyclic, like the Wilson. The difference is that instead of band brakes, it used electromagnetic clutches. These two clutches each consisted of a central rotating disk (a simple steel pole piece) and a pair of coil-carrying rings, one rotating and one fixed (this coil could be considered as either a clutch or a brake). Sliprings were used to transmit electrical power to the rotating clutch elements. Unlike the Wilson, these clutches were controlled by a simple dashboard or column-mounted switch, described as "a cherry on a cocktail stick", and relays. There was no mechanical servo action, so no need for the Wilson's cam or toggle arrangements and the change gear pedal. In the 1950s and 1960s, Cotal used this same technology to provide an electric clutch (with full manual changes through a normal gearbox, but no clutch pedal) for small Renaults like the Dauphine and Caravelle, but it was relatively unsuccessful – it needed to transmit the entire engine torque through the clutch, requiring a relatively large and powerful clutch that tended to give trouble with the sliprings. There was also a similar transmission to the 1930s Cotal, built by Ferlec and used in the Dauphine, with a dashboard button shift. The Cotal gearbox was also used for light railway use. They were used for Wickham diesel railcars, amongst others. A multi-clutch gearbox avoids the difficulties of shifting gear by avoiding the need to shift at all. It operates as a number of separate gearboxes, each one controlled by a separate clutch, interlocked to avoid multiple selection. Selecting a gear is a matter of selecting the appropriate clutch. An advantage of this type is that it's simple to arrange remote operation, as there is no gear shift linkage as such, merely duplication of a clutch linkage. This type of gearbox appeared in the March 1917 Oldbury gearbox trials between 8 different World War One tanks. Each ratio has its own shaft, and its own clutch. Provided the clutches are interlocked so that only one may be engaged at a time, the system is simple. In the early 1980s this transmission was developed for urban buses in the UK as the Maxwell, with a four-speed gearbox. UK buses are mostly double-deckers with rear-mounted transverse engines. Their use also involves much stop-start driving, thus heavy clutch wear for conventional gearboxes. The advantage of this arrangement was its use of four clutches, all easily serviced from outside the engine assembly, without needing to remove the engine. The clutches were multi-plate oil-supplied wet clutches. The first gearboxes gained a reputation for unreliability and in 1985 the original developers, Brockhouse, licensed them to Avon Maxwell Transmissions. A developed version, with an enlarged oil pump, was available as a retrofit for most UK buses. An unusual feature of this gearbox was the ability to engage first and second gear simultaneously. This acted as a 50 hp hydraulic retarder. The Tiger tank of World War Two used a form of pre-selective gearbox, offering 8 speeds. Clutches were used in combinations, allowing many more ratios than actuators. The shift mechanism was hydraulic, to reduce driver effort. There were three hydraulic cylinders, each with two positions and controlling dog clutches for gear trains arranged on four shafts. The cylinders were controlled by a rotary valve on a simple quadrant gear lever and activated by pushing the lever sideways into its gate. The combination of the three cylinders, effectively a 3-bit binary code, permitted 8 different ratios, although in reverse these were limited to just the lowest 4. When the captured Tiger 131 was studied by the British in 1943, the report on the gearbox was carried out by Armstrong Siddeley motors, as experts in such a field. The idea of rapid shifting by clutch alone has also been developed as the dual clutch transmission, in recent high-performance cars. This combines the simplicity of a shifting gearbox with the rapid shifts of a clutch-based design. There are effectively two separate gearboxes, each offering alternate ratios from the overall set, and the two clutches select which gearbox is in effect. Changes within the gearbox are done automatically, to predict which ratio the driver will require next. Provided that the next ratio has been selected correctly (i.e. the computer guessed correctly as to an up-shift vs. a down-shift) the shift itself is merely a rapid movement of the clutch. Unexpected shifts may confuse the system though and it must first select the correct ratio before engaging the clutch, giving a far slower shift. Armstrong Siddeley  Armstrong Siddeley were the last to use the Wilson gearbox. All Daimler models from 1930 to the 1950s used these gearboxes, which were introduced on their Daimler Double Six and soon used in all their vehicles. The chairman reported to the shareholders at their Annual General Meeting in November 1933 "The Daimler Fluid Flywheel Transmission now has three years of success behind it and more than 11,000 vehicles, ranging from 10 h.p. passenger cars to double-deck omnibuses, aggregating over 160,000 h.p., incorporate this transmission ... it has yet to be proved that any other system offers all the advantages of the Daimler Fluid Flywheel Transmission. Our Daimler, Lanchester and BSA cars remain what we set out to make them – the aristocrats of their class and type ... We have also received numerous inquiries from overseas markets. (Applause)". A substantial number of British buses built between about 1935 and 1960 had preselector transmission, particularly those built by Daimler and AEC, and some by Leyland. Some were mechanical, whereas the AEC RT type, universal in London at this period, had the gearbox air-operated (compressed air was also used for the brakes, windscreen wipers, etc. ), which gave off a characteristic hiss when the change gear pedal was pressed. Typical operation of London buses was they had a very low first gear, only used on hills, so the driver when starting would select second gear, depress and release the change gear pedal to engage the transmission, and then select third ready for changing gear on the move, all this done while the bus was still stationary. On starting, just the accelerator pedal was pressed, the gear change to third made at about 15 mph by just pressing the left pedal, and that could well suffice to the next stop where the bus would be stopped in gear and the process repeated. The first motorcycle built with a preselective gearbox was the Viratelle from 1906.to Viratelle site Some 1950s-era James motorcycles were built using Villiers engines that utilized a preselector gearbox. Press the gear pedal down to select 1st gear, then pull in the clutch lever and on its return the gear engaged and drove forward, press the gear pedal again to select 2nd gear and it will engage only after the lever has been pulled in again. Some early internal combustion-engined railcars, both diesel and petrol, used the Wilson preselector gearbox. The AEC-engined GWR 'Flying Banana' railcars had such a transmission. ^ Both types pre-date the automatic gearbox, and so were considered in comparison to the early crash gearbox, compared to which they have much in common. ^ Also why the gear change was a pedal, moved by a powerful leg muscle, rather than a hand control. ^ a b The Autocar (c. 1935). "Clutch and Gear Box". Autocar Handbook (13th ed.). Iliffe & Sons. p. 112. ^ a b c d e f g h Setright, L. J. K. (1976). "Gearbox". In Ian Ward (ed.). Anatomy of the Motor Car. Orbis. p. 91. ISBN 0-85613-230-6. ^ "Track test of 1935 ERA R4D vs Porsche 911 GT3". Automobile. 2004. Archived from the original on 8 March 2005. ^ Fletcher, David (2001). The British Tanks, 1915–1919. Crowood Press. p. 190. ISBN 1-86126-400-3. ^ Glanfield (2001), p. 180. ^ Glanfield (2001), p. 271. ^ a b Blower, W.E. (1952). "Pre-selector gearbox". The Complete MG Workshop and Tuning Manual (7th, 1958 ed.). Motor Racing Publications. pp. 159–171. ^ Blight, Anthony (1970). Georges Roesch and the Invincible Talbot. Grenville Publishing. ISBN 978-0953206414. ^ Chapman, G.W. (1949). "7: Oil-engined Locos and Railcars". Modern High-Speed Oil Engines. Vol. II (2 June 1956 ed.). Caxton. p. 109. ^ Bryan Jarvis (8 March 1986). "No Longer a Pandora's Box". Commercial Motor. 163 (4161): 46–47. ^ "Technical data on the gearbox and transmission of the Tiger I tank". ^ "Rebuilding Tiger tank 131". Bovington Tank Museum. ^ "Wilson". The Manchester Guardian. 22 April 1931. p. 5. ^ "British Diesel Rail Coaches". Engrail History. Archived from the original on 18 February 2013. Glanfield, John (2001). The Devil's Chariots. Sutton. ISBN 0-7509-4152-9. Operation and maintenance instructions of Crossley cars fitted with an ENV gearbox – at this site there are three pages relating to ENV preselector gearboxes including the ENV Manual. This page was last edited on 16 August 2018, at 03:46 (UTC).